May 18-25..$1190/wk ONLY! No pets allowed!! You have to be over 25 to rent at Maravilla. Be our guest: enjoy gorgeous ocean view, beach service, WiFi, 2 pools, condo recently renovated with new wood look tiles, washer/dryer, glass top stove, kitchen/bath cabinets and more. Take in the SPECTACULAR OCEAN VIEW and enjoy tons of amenities in our adorable 1+BR/2BA condo at MARAVILLA BEACHFRONT community. SECOND floor unit with private balcony, recently remodeled in attractive coastal style and soothing colors, comfortably accommodates 6. Located in Maravilla resort, a quiet, popular family-oriented gated resort with PRIVATE BEACH for resort guests only. Complimentary beach service is provided and we've taken care of everything so you can have the ultimate Florida vacation! Get a well deserved night's rest in the master suite’s comfortable KING size bed and unwind surrounded by a soothing coastal style. If you are not tired, stash your reading material in the 2 nightstands with reading lamps, or switch on the second TV. The master bathroom has a brand new tub/shower unit, built-in high-powered hair dryer and plenty of premium towels for your convenience. Kids love our bunk bed (TWIN size) conveniently located in a private area close to the bedroom and separate from the living room. For bigger families there is a QUEEN sofa sleeper in the living room with access to the second bathroom with a shower and plenty of fluffy towels. Our condo was recently redecorated in attractive coastal theme and renovated with elegant wood-look tiles throughout, kitchen/bath cabinets and granite kitchen/bar countertops. Kick back at night with the 40' TV with HBO, DVD player and Bluetooth SOUND TOWER. Surf more than just waves with fast complimentary WiFi. Dining table has comfortable seating for 4 with additional seating at the bar. You'll find everything you need in our FULLY-STOCKED KITCHEN, from enough tableware for a group of 8-10, to a blender and icemaker to keep the frosty beverages flowing. In the morning, a coffeemaker (choice of regular or K-cup), toaster and kettle will get your day started off right. For cooking fans, we have a smooth surface stove, all kind of spices, pots and pans for everything from scrambled eggs to a good old-fashioned crab boil, and when you're done, the DISHWASHER will handle the cleanup. Leave those umbrellas at home! There's complimentary BEACH SERVICE (daily set-up of umbrella and 2 lounge chairs on the beach from March through October waiting for you to relax). You'll find the condo fully stocked with books, games, additional beach chairs and umbrellas, boogie boards, beach and pool toys. Towels dirty after a long day at the beach? Throw them in our in-unit WASHER/DRYER and they'll be as good as new for tomorrow's fun. IRON and ironing board also provided for your convenience. Our luxury condo is located in the cozy Maravilla Resort on Miramar Beach, featuring 2.5 acres of PRIVATE BEACH (never worry about crowds!) with on-site boat rentals and volleyball, 2 pools (one heated), outdoor Jacuzzi, tennis, shuffleboard, basketball, and clubhouse with exercise room. Elevators and luggage carts available in the complex. Maravilla is located just minutes away from all the excitement Destin has to offer. Take your pick: play a round at one of Destin's beautiful 9 and 18-hole golf courses, try a day of putt-putt, go-karting, or water sports, sample the fantastic shopping, including Kate Spade and Saks off Fifth Outlet, at Silver Sands Outlet Mall, catch a movie at Destin Commons, or hit the town to try one of the area's bars or restaurants! You could walk to several great restaurants not far from the resort. Check our calendar to see availability and book ASAP. The sand is sparkling white, the water is emerald clear, this is Destin at its best! Our family with 2 kids moved to US from Europe in 1991. After the initial hardship adjusting to life in US, we purchased a beach condo for family vacations. Over the years we had numerous guests and very special memories in Destin! Presently our grown-up children live on their own and love to vacation in Destin. Now that we are retired, we look forward to spending more time in Destin with grankids! We loved Maravilla from first sight and purchased our condo when the complex was still in construction. We found a paradise where we enjoyed the beach in the spring/summer/fall seasons and the heated pool and Jacuzzi in the winter. During the years Maravilla has been constantly upgraded and beautified. Everything you need for your ultimate vacation is provided in the resort and within walking distance around. The location is unbeatable: drive 2-3 miles west on Scenic Gulf Dr to the prestigious Destin Commons Town Center (Boutique shops, AMC Movie theater with IMAX and excellent restaurants/bars) and same distance to the east to the upscale Silver Sands Outlet Mall. We strive to keep our Maravilla condo well stocked and elegantly decorated, providing all the comforts of home. It was recently renovated in attractive coastal style and colors with new wood look tiles throughout, washer/dryer, smooth surface stove, refaced kitchen/bath cabinets and brand new shower/tub unit in masterbath. You will enjoy all the extras: complimentary beach service every day from March through October, fast Internet WiFi service, plenty of toys, books and games; ‘Beach closet and deck box’ stocked up with beach toys and swimming boards, extra beach chairs and umbrellas (very handy for bigger families and also when beach service is off during winter season). Hair dryer provided in each bathroom. Available in the condo-laundry pacs provided. Free high speed broadband WiFi Internet. Premium bath, hand and wash towels. You need to bring beach towels. Community Fitness Room available in the Club House. Strong signal WiFi is provided in the complex covering all condos. Recently decorated in attractive coastal style. K-cups and a regular coffee maker for 12 cups. Filters provided. Spices carousel, Water filtration pitcher (you need to provide filter-Britta or similar), saran wrap, aluminum foil, dishwasher detergent, liquid soap, paper towels, kitchen trash bags. Dishes and utensils for 10 available. Kitchen/Bar renovated with granite counters. Kitchen cabinets recently refaced with new doors! Additional seating for 3 at the bar. 40' HDTV in Living room, second TV in the Bedroom. Sound tower with Bluetooth connectivity. Kayaks and Boogie/Paddle Boards available to rent at Maravilla's private beach. Maravilla resort has 2 Pools - one is heated in winter season. Community bathrooms are available in the clubhouse and in building 2 (close to the stairs at the pool side). BEACH SERVICE (Set-up of beach umbrella and 2 lounge chairs), High Speed WiFi INTERNET, 2 TVs with cable (HBO), hair dryers. Ceiling fans, tiled floor. Beach closet and deck box stocked up with additional chairs, swimming boards and toys. Community bathrooms are available in the clubhouse and in building 2 (close to the stairs at the pool side). The beautiful Gulf view from Danka’s Condo is exactly what I wanted from a first trip. The condo was very clean and comfortable. The kitchen was well stocked, even had a spice rack. Everything worked exactly as it should. She has sports equipment for the tennis court, and boogie boards, etc. for the water. Since the weather was cool, it was very nice to have a heated pool which we used most of the time. When we went to the beach, the two free beach chairs/umbrella set up was a great perk. I have paid over $100/week in other places for the same service. We enjoyed our stay, and will definitely stay with Danka on any future trips. She was extremely nice and prompt in all our correspondence. Second time back in Danka's Condo! This was our second time coming to Danka's condo in December and our stay was just as amazing as the first! So amazing to wake up to the view of the water and warm up mid-winter. 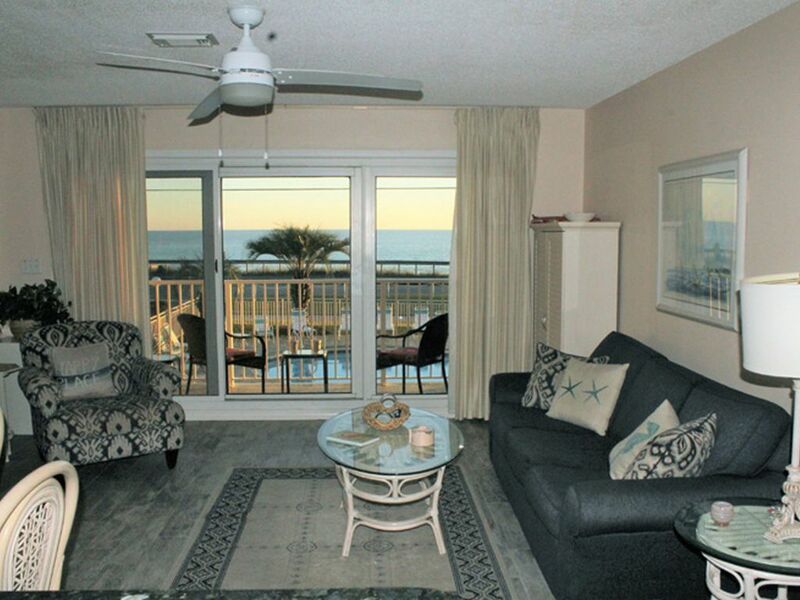 The condo is in a great location right over the pool and beach, and looks just as pictured. Danka was super-responsive to our questions and thoughtful in making sure we had everything we needed. We loved the updated bathroom and appliances! We'll be back again, thanks for a wonderful stay! Thanks - we loved having you as our guest and look forward to your next stay! Loved the large family area and well stocked kitchen. Very clean and has everything you need for fun. Loved the umbrellas and beach chairs and extra thinks on the patio. Comfortable bed also. Would have given 5 stars but all of the rules had me so anxious. I had no idea what “excessive” sand meant so I was constantly sweeping. We are very glad that you liked everything in the condo and thanks for pointing out the confusion with the rules. We strive to keep the condo in excellent condition for our guests, and will review the rules to make sure they are clear and not an undue burden going forward! Wonderful property with amazing views! Upstairs tenants were very noisy, but will return! Ms. Danka was very responsive throughout the entire booking process, during and after our stay. The unit is VERY nice, clean, and comfortable. All the comforts of home can be found in this condo. Having the extra beach chairs and boogie boards available for our use was a niced added bonus. We enjoyed making our memories in your beautiful condo. Onsite PRIVATE BEACH and RECREATION AREAS with 2 pools (one heated), Jacuzzi, outside showers, charcoal BBQ grills around both pools, 2 tennis courts, shuffleboard, basketball goal, clubhouse with fitness room. Plenty of green space. Golf is within 2 miles, DESTIN COMMONS is 2-3 miles west (Movie Theater and boutique shopping), upscale Silver Sands OUTLET SHOPPING MALL and Morgan's Family Entertainment Center are just 2-3 miles east, several excellent RESTAURANTS within walking distance. Other Destin attractions include kids favorite Big Kahuna Water Park, Gulfarium, deep fishing and dolphin excursions. NO PETS, NO SMOKING Please! You have to be over 25 yrs of age to rent at Maravilla. Weekly rentals ONLY, Sat to Sat. 4 days minimum during winter season.